Brian Gross Fine Art is pleased to announce A New Slant, an exhibition of paintings by the late Bay Area artist, Leo Valledor (1936-1989), opening January 6, 2018 with a reception from 4-6pm. On view will be paintings that explore Valledor’s creation of perceptual space within hard-edged painting through his use of geometric forms and dynamic color combinations. The exhibition also presents a group of works in which the artist explores reductive painting through gestural mark-making. A New Slant will be on view through February 24, 2018. 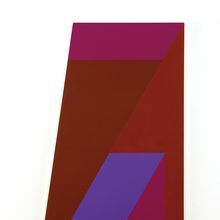 A pioneer in the field of hard-edged painting during the 1960s, Valledor’s primary concern was color, especially the viewer’s experience of it over time. Valledor also viewed color in relation to music and sought “harmonic color”, or the perfect structural kinship between music and color. It is the synthesis of these ideas that set him apart from other painters of the period. In paintings such as Aslantis (1986), Sunstrut (1982), and the title work of the show, A New Slant (1981), Valledor divides his shaped canvases with complex geometric forms painted in vibrant colors that combine to create perceptual depth. 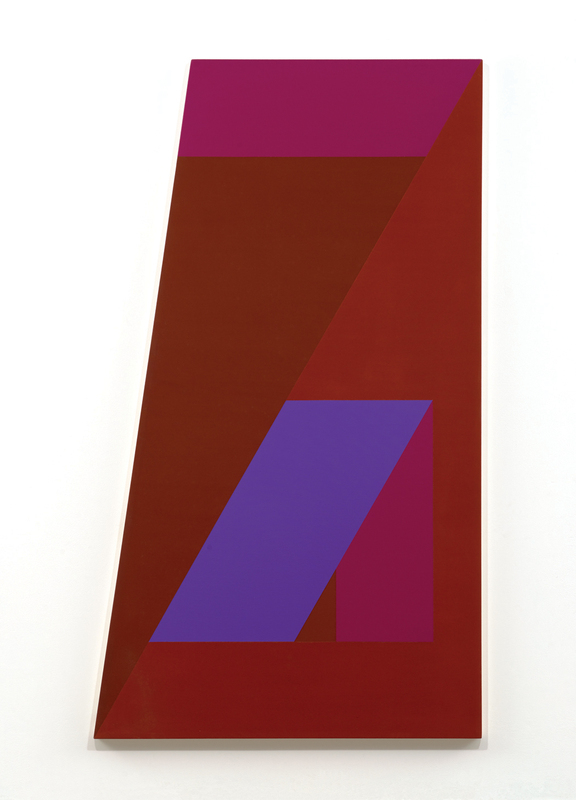 Works such as East-West and Alone (both 1968) reveal a moment when Valledor explored reductive abstraction in a new way after his return to San Francisco from New York in 1968. In these works, called The East-West Series, the artist uses bands of metallic color at the edges of the canvas to define interior forms, reduces his colors to a muted palette of textural greys, and employs gestural marks to move beyond the borders of his geometric shapes. In SF Spring-Sweet Rain (1974) Valledor experiments with the subdued tones and textural surfaces of the East-West works in a multi-panel shaped composition. Leo Valledor’s work has been the subject of numerous solo and group exhibitions throughout the United States, Latin America, and Asia. His work was included in the 2017 Grey Art Gallery, NYU, exhibition Inventing Downtown: Artist-Run Galleries in New York City, 1952-1965. 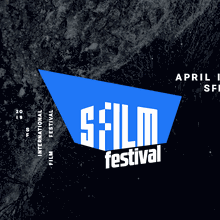 In 2014 his works Skeedo and For M were acquired by SFMOMA for the permanent collection and are currently on view at the museum as part of Open Ended: Painting and Sculpture Since 1900. Leo Valledor’s work has also been shown at the Fine Arts Museums of San Francisco; Denver Art Museum; Dallas Museum of Art; Oakland Museum of California; Blanton Museum of Art, Austin, TX; Phillips Exeter Academy, Exeter, NH; Instituto Torcuato de Tella, Buenos Aires, Argentina; Museo del Arte, Caracas, Venezuela; Belca House, Kyoto, Japan; and Georgia Museum of Art, University of Georgia, Athens, GA.
Leo Valledor’s paintings can be found in collections across the United States, including SFMOMA, Philadelphia Museum of Art, Yale University Art Gallery, Fine Arts Museums of San Francisco, Berkeley Art Museum, Oakland Museum of California, Seattle Art Museum, Allentown Art Museum, St. Louis Art Museum, and the Crocker Art Museum, among others. This is Leo Valledor’s second exhibition at Brian Gross Fine Art.